Because of wild fires late last season, we were forced to cancel the final two Weekend Group Mining Projects that we had scheduled. We don’t like to cancel scheduled projects for a number of important reasons. Perhaps the most important is that we take people on these events and; as one big team, go out and do some real gold mining. This sends people away with authentic experience and some confidence that they can come back out and find their own gold as long as they are prepared to invest some personal effort. Another reason we don’t like to cancel is that some people plan their entire vacations around our Group Projects, and then continue to mine more gold in the very same locations afterwards. Some arrive from long distances away — like Florida or even Europe. It’s a long way to come just to be turned away! We have a moral duty to provide them with a positive gold mining experience. The smoke was so thick in August of last year (2017), it was difficult to see the other side of the Klamath River down at Wingate where we had been mining all season. It’s not reasonable to ask people (except fire fighters) to go out and do physical work under those circumstances! So when around a dozen people arrived at our office on Saturday morning to join in our final project of the season, sending them away was not an option. They were traveling at the time we cancelled the project, so they did not know the project had been cancelled. But they all invested considerable time and resources to participate in our program. Some of our Project helpers suggested that the smoke was not as bad upriver. Heck, we have miles and miles of gold-rich properties upriver from Happy Camp. So we hooked onto the trailer of my jet boat, loaded up some basic sampling tools; and everyone followed me by vehicle upstream. By the time we reached the small town of Seiad, about 25 miles upriver from Happy Camp, the smoke had thinned out enough that we could do some prospecting without killing people off from smoke inhalation. We settled for prospecting our “Sluice box” claim which is just downstream from Seiad. Sluice box was a good choice because there is a U.S. Forest Service boat launch in that location. Also, many years ago, we did nearly all our Group Projects there, targeting a contact zone between two layers of streambed that was around 14 inches deep into the material. We only worked a small portion of the upper claim with our pick & shovel methods. The gold there was always good. I had a feeling we could move upstream from where we left off and find a continuation of the very same gold deposit. After launching the boat and giving a panning demonstration for the beginners, I used the boat to place small teams of prospectors up and down, and on both sides of the river near the top end of this very, very long claim (maybe 4 miles). While all of this was going on, I spotted a group of New 49’er members working very determined-like on the road side at the top-end of the claim.. When I motored over there in my boat, they more or less gave me the cold shoulder. This is very unusual in The New 49’ers; because all our members are friendly, especially to me. I have learned during the 33 years we have been in business that the cold shoulder from one or more New 49’ers can only mean one thing: They are mining a rich gold deposit and do not want to share any of it! There was no way to park my boat where they were working without upsetting the river’s flow through their sluice boxes. So I parked my boat down at the river access and walked up there to take a closer look at what they were finding. I recognized all the members from seeing them around the office and at our potlucks. Most had participated as beginners during earlier Weekend Group Projects. Now they were out recovering their own gold. This is the whole idea! Pointing at the place where they were mining. These were very nice people! But none of them were happy to see me. They were worried I was going to introduce another dozen or so people into their golden discovery. This is something I would never do unless there was a welcome invitation. There was zero invitation; not even for me to have a look at what they had found. I have been through this many times over the years. It can actually be very dangerous! Volume amounts of gold (in the eye of the beholder) can bring out the best and the worst in any human being. As I said hello and attempted to move in closer to see what was in their sluice boxes, the largest, and obvious leader of the group quickly stepped in my way and met me with his big chest. This guy was much larger than me; and his determination to keep me away was stronger than my curiosity. Our Rules provide protection to any member(s) who make a new gold discovery. I never break our rules. These members deserved confidentiality if they wanted it. The others positioned themselves so I could not see what was in their gold pans or sluice boxes. Wow; what a good signal that they found something good! The guy met me with a threatening tone, leave our gold alone! So I wished them a good day and withdrew politely, knowing that whatever they found had them all wound up with a strong case of gold fever. Later on, one of the guys who was up there volunteered to me that he panned more than 6 ounces of beautiful gold in just under 2 weeks. That’s a high-grade pay-streak! Back in my boat, I went around to pick up all the people I had distributed along the river and brought them back to the boat ramp. None of them had turned up anything exciting through their sampling efforts. This is not unusual. 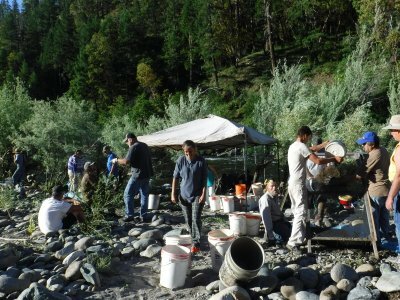 There is nearly always a little bit of gold wherever you dip a pan along the Klamath River. But we are looking for the narrow path where most high-grade gold deposits are hiding in and alongside the river. If you are not sampling on this narrow path, you seldom find more than traces of gold in your samples. This is the way you discover where the gold path is not located. Then from additional samples across the waterway or gravel bar, you can discover where the gold path is located. Some of the pans down by the boat ramp were extraordinary! Since the boat ramp where it reached the river was lined up perfectly with the place further upstream where the group of members were working so secretively, I suggested we just walk upstream a ways and start sampling on the edge of the river. And there it was on the very first pan! It was not long before everyone in my small group was happily panning shallow gold alongside the riverbank. Satisfied that I had accomplished what I set out to do, I loaded my boat back on the trailer and drove away. My duty was accomplished! Now turn the clock forward to our ongoing 2018 season. Where do you think we decided to do the Group Mining Projects this year? Up on the Sluice box claim, of course! We are blessed to have a dozen or so extremely loyal members who help out on these projects. Sometimes as many as a hundred people show up for these events. One time, we had more than 200 people attend a project which required me to go out and buy a bull horn! The gold split on Sunday afternoon took hours! There is no way we could make these projects come out well without the help of so many volunteer members. By “coming out well,” I mean finding enough gold on Sunday that all the participants can see how the gold adds up when you process larger volumes of the right kind of material. “The right kind of material” means gravel with a healthy concentration of gold in it! 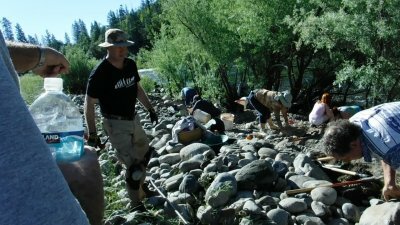 To dramatically reduce the possibility of failure (not recovering enough gold) on these projects, we have several volunteer members who sample all up and down the Klamath River nearly every day of the year. I suppose they take some time off if the winter rain or snow makes it too uncomfortable. They let me know when they locate promising areas along the river to do these Group Projects. In fact, most of the areas where we have done these Projects during the past 4 or 5 years have been initially discovered by this sampling team or others. 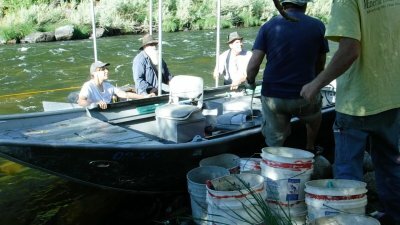 In addition to that, before we fully decide on a Group Project location, our group helpers and I launch my boat and visit the area with some basic prospecting tools. This is always just to verify what we pretty-much already know to be true from earlier sampling activity. Here is one of our better sample pans! We do this is to make absolutely certain that we avoid the serious blunder of not recovering enough gold to go around on Sunday afternoon. Since I am the one who splits up the gold among the participants, it is vitally important to me that we will do the projects in a good gold-producing place. Some of the people who were mining at the top end of Sluice box last season had returned. But this season, they were as friendly and welcoming as could be. Why? Maybe it was because I did not invade their gold discovery last season. In any event, they were happy to show us the gold they were recovering along with everything else they had discovered near the top end of Sluice box. Their gold recovery was quite impressive! Look at this gold from just 4 pans! That’s all I needed to see! Our purpose was only to confirm the gold deposit. It took us less than an hour to put the boat in, confirm the deposit, pull the boat out and head back to town. We pulled a team together the following day and moved all our project gear over to the site. This included our beloved floating sluice; a gold recovery device that we constructed several years ago. This is a cool gold recovery system that floats a sluice box in deeper water and can be adjusted to allow the river’s natural flow to wash pay-dirt across the recovery system without the need of any mechanical assistance. Rather than move the floating sluice inside my boat up to our destination, I decided to try and tow it up there behind the boat. This is a bit risky; because if the sluice box dips into the river even just a little bit, the entire floating recovery system will abruptly dive to the bottom of the river. This was just another fun day on the river! Nobody got seriously hurt, the floating sluice could be repaired; and we put on an exciting show for all the onlookers, including perhaps 70 rafters who were taking a lunch break. We also learned how not to tow the floating sluice up through a set of rapids. We all got a pretty good laugh at our misfortune once it was all over. Saturdays during our Group Projects are broken up into 2 parts. We devote the morning at the air-conditioned Happy Camp Grange Hall and do introductions so we can all get to know each other and start to build the team experience. Then I provide my best presentation about how to find high-grade gold deposits by following a simple sampling plan. To keep it interesting, I add in some true adventure stories. 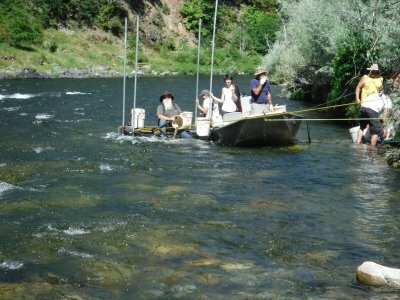 There are plenty to choose from, this being our 33rd season with The New 49’ers along the Klamath River. I guess I have just about seen or heard of nearly everything and anything in the way of both good and bad experiences. Fitting this in with the theory helps create some entertainment and perhaps makes the information sink in a little better. Derek Eimer giving a helping hand to the beginners. After lunch on Saturday, we all pull together and travel to the project site. Then we devote the afternoon to pan-sampling in the area where we plan to work on Sunday. 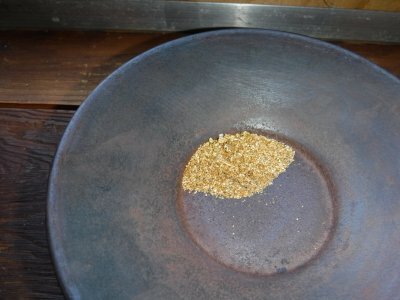 Beginners are taught how to gold pan, and begin finding their first-gold. It is important to realize that finding your first gold on the river is a life-changing experience! Under the direction of our experienced helpers, the more experienced participants work in coordination to find the richest pay-dirt out there so we can target that the flowing morning. I was seeing some really good pans out there on Saturday afternoon! Everyone gets to keep the gold they find on Saturday. The best gold is coming out of the roots! We host a Saturday evening potluck at 6:30 pm during these projects at the Happy Camp Grange. We always ask everyone to bring something to contribute to the meal. I personally supply enough hotdogs to make sure everyone is going to have something to eat. With so little time remaining on Saturday afternoon, I don’t know how they do it; but the food tables were overflowing with all sorts of interesting dishes, and even a bunch of yummy deserts. There were enough of us to nearly pack the Grange Hall. This is very rewarding to me. Some participants come from half way around the world! Before and during dinner, the happy chatter inside the Grange Hall was loud enough that you had to raise your voice to be heard just across the table you were sitting at. This happy chatter is better than my favorite music. Having now been managing a gold mining association for nearly my entire adult life, I am very sensitive to the signs of good or bad tidings when a group comes together. I have seen it both ways in my time. It is the difference between heaven and hell on this earth! Take my word for it! To my grateful relief, this group of prospectors were singing the happy music that I have grown to love. We always do a short meeting after dinner, and then a prize drawing. We try to make this short, because we were all going to meet up at the project site at 6 am the following morning so we could finish the hard physical work before the heat of the day makes it uncomfortable out there on the rocks. Over the years, we have tried many different ways to quiet the ongoing roar of excited conversations in the hall. This is so I can begin the meeting. We have tried yelling, whistling, whistles and even blow horns. While all of them work, those are uncomfortable methods of quieting down such a roar of enthusiastic chatter. One time, a long time ago, I went so far as to yell, “Shut the —-up!” That’s a terrible way to turn down the beautiful sound of music. But I was a lot younger in those days and still had much to learn. Just in the last few seasons, I have come to realize that if I stand up front of the group with a kind demeanor and raise my right hand, the word circulates around quickly that it’s time to quiet down so the meeting can start. Please don’t ask why it took me so long to learn this. Some of the best lessons in life take time to learn. For the most part, the meeting was about my hopes and perception that the political winds appear to be changing in our favor, and there is reason to hope we will be dredging for gold again in California, perhaps as soon as next season. Or if not then, the time is not far away. I’ll talk about this more below. Everyone went off after a short prize drawing with plans to meet early on Sunday morning out at our mining site. Most everyone on Sunday morning were wearing extra clothing to stay warm. That’s the way we like to begin these Sunday Group Mining Projects. Besides safety, the primary objective on Sunday morning is to dig up as much rich pay-dirt as we can, put it in buckets, carry the buckets over to a classification screen so that all of the larger-sized material can be separated out, and then direct the classified pay-dirt to the recovery system. I had offered to pick up Diane Helgesen on Sunday morning up at Elk Creek Campground and give her a ride out to the diggings. Diane has been one of our most active and loyal supporters for as long as I can remember. Among several others, Diane is so dedicated to The New 49’ers, that if we were attacked by a wild bear or angry mountain lion on one of these projects, I’m certain that she would stand out in front of all of us; and with no fear, command the wild animal to “go home!” And the animal would certainly comply. I’m not kidding! If anyone ever complained about The New 49’ers within Diane’s hearing, I’m sure she would give them a spanking that they would never forget! When Diane and I arrived at Sluice box at about 6:15 on Sunday morning, everyone was already hard at work. There were people digging pay-dirt which they had discovered the day before and placing it in buckets. Others were carrying the half-filled buckets to the large classification screen provided by long-time supportive member, Mark Turner. Several participants were working the pay-dirt through the quarter-inch screen. The dry material went through easy. The wet material took more work to classify. All the classified pay-dirt dropped into two large tubs. Others were shoveling this into buckets that were directed to our floating recovery system. It was all like one big production machine! The thing slowing our production machine down was that Dickey and our other helpers could not get the proper water flow from the river going through the floating sluice. This was a problem we had never encountered before. There was just something wrong about the way the fast water was surging, and then withdrawing, through the sluice. We attempted a number of solutions, but none of them resolved the problem. By this time, every bucket we had (hundreds) was filled with classified pay-dirt and ready to be processed; and our whole production machine (maybe 60 people) were just standing there watching us. Not good! Ultimately, Dickey and John Rose (team leader on these events) decided we needed to push the sluice further out into the fast water of the river. So we pulled my boat up and placed it between the side of the river and the floating sluice. Even that was not enough. So we all started packing large rocks out there to push my boat further out into the river. Finally, Dicky announced that the sluice was working properly and we started processing pay-dirt. were filled with pay-dirt even before we got the recovery system dialed in. We probably lost an hour of valuable production over getting the recovery system set up to work properly. That is unfortunate in the loss of gold we recovered on Sunday. But it was a valuable lesson for everyone that was out there. Sometimes things just don’t go your way. The answer is to keep at it until you have things dialed in. We are up and running now! We finally positioned the floating sluice far enough out in the water to make it work right. Once the sluice was working properly, Dickey fed in the pay-dirt as fast as the device could process it. 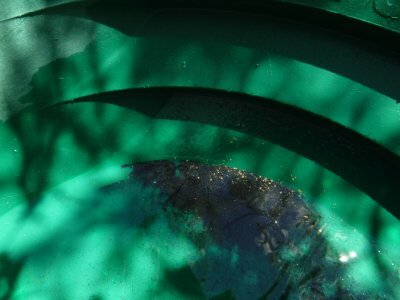 Here’s the other thing: If you over-feed a gold recovery system, the gold-catching elements of the recovery system become overwhelmed and the gold feed will just wash out with the tailings! Said another way, any gold recovery system has an optimum capacity. If you don’t exceed it, you catch all or most of the gold. 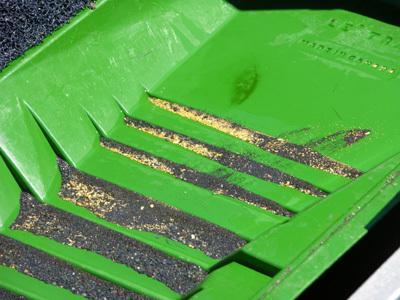 If you over-feed it, you bury the gold traps and wash the gold right through the recovery system along with the sand and gravel. This is why we always place Dickey in charge of feeding our floating sluice. He has a unique perception of how to feed the recovery system to the limit without losing the gold. After all, as a result of all of our combined effort, Dickey is in that key position to either recover the gold or let it flush out from over-feeding. I suppose that makes Dickey the most important guy on the team! We were digging more material than we could process! Seeing the gold in the river! We like to try and finish up these projects by around 5 pm on Sunday afternoon. This is because some participants already have plans to start on their way home after getting their share of the gold. Processing streambed material through a recovery system out on the river is only about half of the overall process. The recovery system also concentrates heavy iron and other materials. There are additional processes to separate the gold from all the other impurities. Knowing how this is done is a big part of becoming a successful gold prospector. We do these final processes back at the Happy Camp Grange Hall later in the day. It takes a few hours to complete the final separation, weigh the gold, and split it up evenly among all the participants. All of this is quite unique in that we teach beginners and intermediates how the full gold mining process is accomplished, from learning to use a gold pan, to sampling for high-grade gold deposits, to production mining in pay-dirt, to final gold cleanup procedures without the use of any chemicals, to weighing all the gold we recovered from our combined efforts with little or no losses, to providing everyone with a fair split of the gold we recovered. That’s quite a lot of knowledge that took me years and years to learn on my own! There was a lot of gold visible during our final clean-up steps. But most of the gold was fine (small) in size. 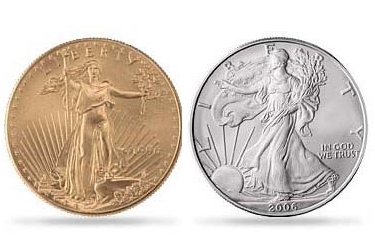 We have been fooled many times in the past believing we recovered more gold than it added up to on the scale. This was just one more time. In all, we recovered 11.2 pennyweights (20 pennyweights make a troy ounce of gold). There were 9 pieces of gold that were large enough to meet the legal standard of a gold nugget. I personally expected the weight measurement to be much higher. But I have been fooled by large amounts of fine gold many times during the past. Millions of tiny colors in a gold pan or set of concentrates often look to be more until all the impurities are removed. The bottom line is how they weigh up on a scale. The gold was split among 51 persons who were in attendance at 5.3 grains each. We have done better. And we have done worse. This is the way it is with gold mining. There are never any guarantees about how much you will recover. All participants seemed happy with the result because the same excited, enthusiastic chatter from the night before at potluck was overwhelming in the Grange Hall as I passed out the shares. It’s not only about the gold, although the gold certainly keeps our program alive with thousands of active supporters. It is also about the learning and hands-on participation; and perhaps most about developing life-long friendships and belonging to a group setting that is truly trying the make America great again; something that is larger and more rewarding than just ourselves. We ended off at about 5 pm on Sunday afternoon, and I was truly happy to see a bunch of New 49’ers go off feeling good about what we accomplished over the weekend. Join us for our Final Group Mining Project on August 18 & 19! Our 2-day Group Mining Projects are one of the primary benefits of New 49’er membership which sets us apart from other mining associations. All weekend events are free to Full & Associate Members. Our Special Memorial Event was Lots of Fun! In concert with several other organizations, we sponsored a special 3-day event in memory of three of our closest supporters who recently passed away: Ray Koons, Myrna Karns & Gary Wright. The event took place on July 6, 7 & 8 at the Happy Camp park. 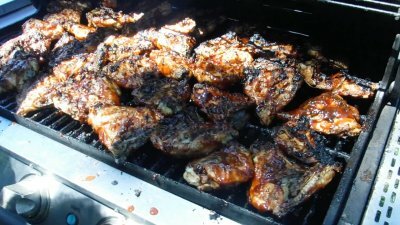 We put on a metal detecting seminar, mining demonstrations, a coin hunt to win prizes, a hot dog and hamburger lunch; and a special chicken BBQ was provided by longtime member and supporter, Dan Effman. Our staff worked hard to make this event fun for the whole family. Many thanks to Samantha Everett and Armadillo Mining Supply in Grants Pass, Oregon, and master detecting guru’s Josh Bohmker and Trever Sheffield who also came over from Oregon. In real terms, the true value of the gold along these extensive properties is probably more valuable than the net assets of any financial institution on the planet. We should be calling our properties the “Klamath First National Bank.” Ours is the only bank in the world where you can go out and make a draw anytime you wish. There are no interest or bank fees to pay. And you never have to pay the gold back! This is as close as it comes to an opportunity to maintain some degree of personal freedom during difficult or troubling times. As far as I know, we are the only organization in the world that makes a very large bank of pure wealth freely available to our members. Having said that, most of us remain disappointed that the State is preventing us from using motors to gain access to the more valuable deposits of gold which are largely out of reach to non-motorized programs. Please believe me when I say we are exhausting every effort to reverse this situation. There remains hope that America will wake up and realize we need to produce value and wealth in excess of what we consume. Mr. Trump and his team appear to be leading the charge on this, though he is not getting as much support from congress and the mainstream press that he deserves. So we must try and estimate the depth of the swamp and predict if Mr. Trump has the capability to drain it. The whole world hangs in this balance. It remains too early to predict the outcome. Our suction dredging industry in the Western U.S. has been shut down over concerns for the endangered or threatened Coho salmon. This, even though there is zero evidence that suction dredging ever harmed a single fish of any kind. In fact, the most recent study performed on the cumulative impact of all suction dredging determined that the effects were so small that they could not be measured. But the deep State is not interested in real science that does not support their narrative. So productive activity is closed down by the States while they continue to sell millions of fish-kill licenses to anyone who wants to go fishing, and while our valuable forests, and now some communities, are burning to the ground. There are some signs that the political winds are finally trending more in our direction. 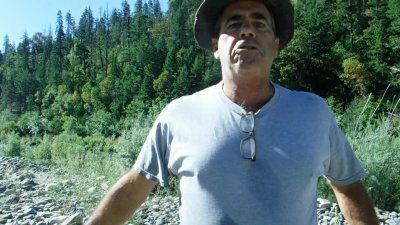 My sources are telling me that the State of California has informed the Klamath National Forest (KNF) (where all our gold properties are located) that they should prepare for suction dredging to start up again during the 2019 summer season. KNF has taken this seriously enough to post an experienced Minerals Officer in the Fort Jones District that manages both the Salmon and Scott River watersheds. 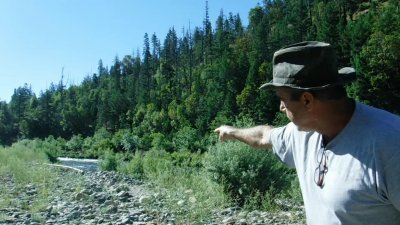 The Salmon River is ground zero where all the years of litigation started with the Karuk Tribe. On top of that, myself and others have been invited and will attend a meeting later this week with California Water Quality Control officials who are beginning the process of adopting a permit to allow suction dredging while protecting water quality. Largely due to what I have explained in the paragraphs above, I personally believe we should stay the course for a while longer and see how these larger forces play out. I am willing to invest my personal resources to keep the program going as long as you guys, our members, are also willing to hang in there until we overcome what is destroying America, or it becomes clear that there is no longer any hope. Here’s an image of Terry his wife Anita supplied that was taken about the time that they joined The New 49’ers. 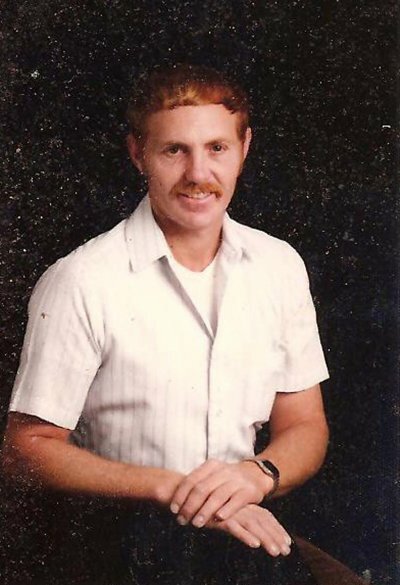 Terry passed away on July 8th after fighting a very long battle with vascular disease and cancer. Before he got sick, Terry was the hardest-working man I have ever met. He was also very good at everything he did. When we lived on the coast, he was a successful commercial fisherman. He was a very good mechanic and also a carpenter. Terry could make a good living under all the different circumstances we faced over the many years we were together. It was in 1984 that we became interested in gold mining. That year, we went into the California Department of Fish & Game and asked them where we could go to find some gold. 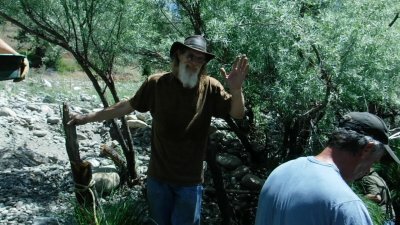 They gave us maps and pointed us to some high creeks in the Trinity mountains. We hiked up there and found a little gold. Then we saved our money and went up to Alaska during the summer of 1986. It was there that Terry had his first experience using a 10-inch suction dredge. 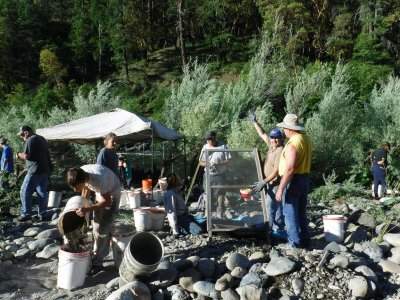 Hoping to find a good gold prospecting opportunity that was closer to home, we stumbled upon The New 49’ers in Happy Camp along the Klamath River in 1988. First, we tried our luck with a 3-inch dredge during a single weekend. We went home with enough gold to prompt us to become lifetime members of The New 49’ers. After that, we were mining the Club’s properties on every weekend. 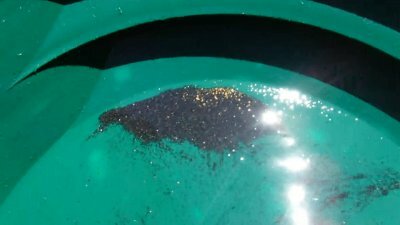 Then, when we stepped up to a 5-inch dredge, we recovered more gold than we had ever seen. That prompted us to move to Happy Camp. At that time, Stone Forest Industries had an operating saw mill in Happy Camp. Terry went right to work for them taking on various responsibilities in the mill. We took the opportunity to mine for gold on every weekend and holiday. As Terry became experienced at finding richer gold deposits, he took beginning 49’er members under his wing and also showed them how to find the gold. We really enjoyed meeting and making lifelong friends at the Saturday evening pot-lucks. The number of friends, experiences and adventures we have had are too many to tell. But one of my fondest memories is of fellow New 49’er, Dan Porter. With a little help and encouragement from Terry, Dan was able to pay for all his mining equipment, and even do a Caribbean Cruise by cashing in the gold he found. There have been many other close friends with similar stories to tell. 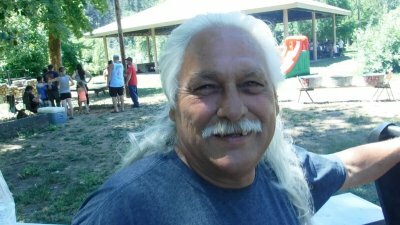 Terry has moved onto whatever is next ahead of me, his three sons, and several grandchildren. Wherever he is, I know he will be waiting patiently for all of us so he can help show us the way. Meanwhile, we are comforted by all the wonderful time we shared together in this life. 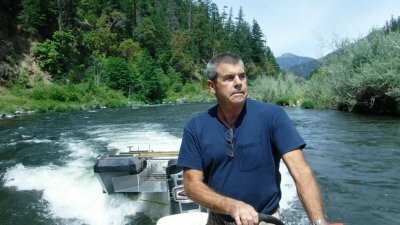 Note from Dave Mack: Terry evolved into commercial dredging during the 1990’s when the Klamath River was home to, likely, the most active commercial underwater mining industry in the world. There were dozens of hard-working underwater miners up and down the river. Many of us used jet boats to support our operations into the more inaccessible deep river canyons where no miner had ever touched before. We found exceptionally rich gold deposits in those places. Many remain in place! While we competed amongst each other in a friendly way, we always supported each other in a more important way. It was during the 90’s that we developed underwater conveyors to remove rocks from our excavations more efficiently, and underwater-controlled winches on floating platforms so we could move the big rocks out of the way without ever slowing down nozzle production. During the cold winter months, we contracted to build specialized underwater mining machines that were destined to other countries. Terry played a big part in all of this. The thing I most respected about Terry is that he was always his own man. He never asked permission from anyone. He moved ahead as he saw fit. 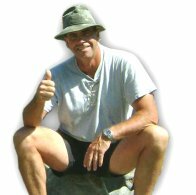 And he always had a number of close friends who supported his adventures – along with others who depended upon Terry to provide assistance in making their life-dreams come true. This drawing will take place in Happy Camp, California at our office at the close of business on 25 October 2018.. You do not need to be a member of our organization to participate. You do not need to be present to win. There is no limit to the size or frequency of your contributions, or to the number of prizes you can win. To conserve financial resources, we have reduced open office hours to 9 am through 4 pm, Monday through Friday. Our office will remain open on Saturday mornings only during the weekends when we are sponsoring Group Mining projects: The final Project this season will start on August 18.